In this interview, Elee Kraljii Gardiner reflects with founders and organizers Leah Horlick and Estlin McPhee about the Vancouver-based anti-oppressive REVERB reading series. (http://www.reverbqueers.com ) REVERB ran from January 2013 to June 2017. Elee Kraljii Gardiner: Congratulations, Leah Horlick and Estlin McPhee, on the conclusion of REVERB, the anti-oppressive reading series for queer writers you shepherded since January 2013. (http://www.reverbqueers.com ) You held your final event on June 12, 2017 with Amal Rana, Jillian Christmas, Raven Salander, Fayza Bundalli, Ben Keane-O’Hara at the Roundhouse Community Center on the unceded Musqueam, Squamish, and Tsleil-Waututh land in Vancouver. Are you experiencing mixed emotions about the wrap-up? Or one joyous “yeah!”? Leah Horlick: Thanks so much for the kind words, Elee. I felt like the series was a tremendous success, and it was a huge amount of work – it’s also the longest project I’ve ever been involved in. Personally I’m feeling a lot of relief and some very selfish joy about being able to have 100% friendship time back with Estlin. I think we’ve always done a good job of shifting to “business time” and integrating it with ordering takeout and watching a lot of dance movies, but I’m thrilled just to have time for reflection and snacks and non-business hangouts. Estlin McPhee: I’m feeling really happy with the work we did! We put a lot of heart and thought into the five years of events we had with REVERB and it was great to end on such a high note with our amazing line-up of final readers. In particular, I feel a lot of joy about how many other amazing literary events have emerged in Vancouver in the last few years. Now that we’re done organizing REVERB, we have more time to go out and support other events, which is wonderful. I will certainly miss the magic that we got to facilitate on our stage but am looking forward to being able to focus on other projects and watch more dance movies with Leah. EKG: What was the impetus to start the series? 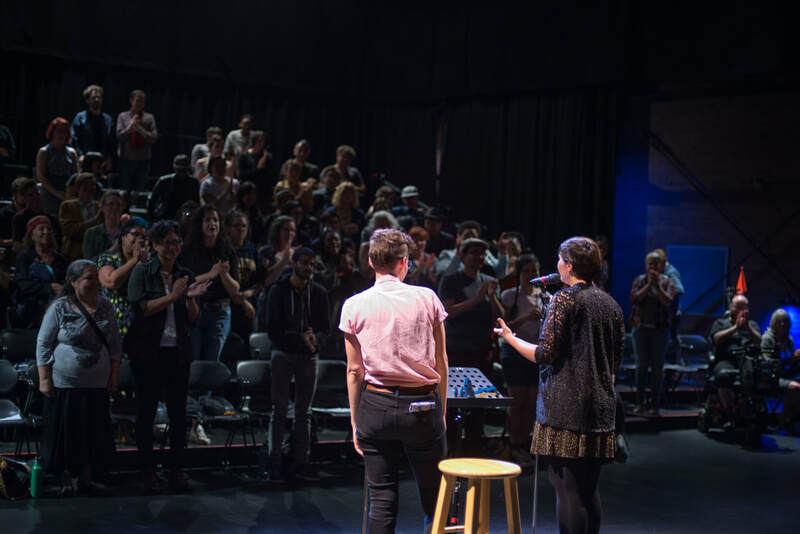 LH: Estlin and I were in different cohorts of the same MFA program, and I know we both experienced a lot of disappointment and hurt about the kind of queer inclusivity we expected and the kind we received. There was a lot of covert (and overt) homophobia and heteronormativity, which really got to me since I moved here from Saskatchewan and was expecting some West Coast queer utopia. (A good exercise in managing expectations). I think we were also really disappointed at the way our queer content was received, and how lonely it felt – which isn’t to say that we were the only queer people in the program, but more that some of our subject matter felt really alienating. There were also so many nights at departmental readings where I felt like queerness was being used as a cheap punch line or an “edgy” theme. I didn’t want to bring my friends to readings. Then I was accepted into the Lambda Literary Retreat for Emerging LGBT Writers to study with Jewelle Gomez, and had to raise some funds to cover my tuition and travel. So many community folks chipped in but I still needed to host a fundraiser – our first event was to help me with those costs. It was at the Toast Collective and we set up the readers in the little window looking out onto Kingsway. Amber Dawn read – this was before we were friends – and I was totally starstruck. I remember I baked a lot of cupcakes and Erin Flegg worked our little concession. It feels like a very long time ago, now. EM: It does feel like a very long time ago! That fundraiser event was serendipitous – I was running The Sunday Shortstack out of the Toast Collective at the time but had paused pancake breakfasts for the summer months, so I was looking to organize something that would contribute to my rental costs there. When that event went well, Leah and I naturally started thinking about a series. It felt so good to create a space on our own terms. That feeling that Leah named of not wanting to bring friends to readings that were happening in our department or in the city was so real for me – all I ever wanted from poetry IRL was a space that I felt excited and proud to invite my friends to. More than anything, that was the seed for REVERB. EKG: How do you define “anti-oppressive” in terms of hosting a reading series? We believe that writing is a radical act that can transform dominant narratives about whose lives and loves are important and valued, and that sharing that writing can empower, inspire and transform ourselves and our communities. We’re committed to radical inclusion in our series, recognizing that access to the world of writing, literacy, and even queerness continues to be limited. As organizers, we endeavour to create a reading series where white-identified readers are always in the minority to ensure a space that centres the voices of Indigenous, Black, mixed writers and all writers of colour. All our writers self-identify on a spectrum of queerness that centres trans and femme experiences. All of our events are held in physically and financially accessible spaces, and with every event, we make at least one change to ensure that REVERB becomes more and more accessible. We promise to do all we can to create a safer space – bring your suggestions! Check your assumptions at the door; REVERB is a body-positive, anti-racist, anti-sexist, and hella queer- and trans-positive event. We knew we weren’t going to get it right every time and that there would always be things to work on and issues we hadn’t considered. But it was really important to us to try our best anyway and then listen hard to feedback, learn, and try again. EKG: What concrete, practical factors go into running a series or hosting an event like a REVERB reading? I’m thinking about Vancouver’s lack of accessible, free venues, for example…but perhaps you can comment on what needs attending to in other ways? EM: Because we worked hard to compensate everyone involved in this series, the concrete barrier we ran into the most was finances. There is a shortage of accessible, affordable venues in this city and there’s also a shortage of funding for small, community-based projects that don’t fit into a Canada Council model. It was important to us to always have ASL interpretation at our events, to have snacks available, to have a welcoming by an Indigenous elder, to name a few of our considerations – and once you add up the cost of creating the kind of space we really wanted to have, our bottom-line was quite steep! Scrambling for funding with every event was definitely the most challenging and least fun part for me, which was hard because it was also one of the most essential parts. One thing that we did was create a timeline for every event – knowing that our publicity had to be out about three weeks before the event itself and then working backwards from there. Over time that became pretty intuitive and automatic but I think that’s a practical, useful way to start. Because honestly the first steps – booking the venue, pinning down the date, securing funding, and then inviting your readers – need to happen months before the event. Many months. And each piece of the planning hinges on the piece that came before it, so knowing your timeline is important. And always giving yourself more time than strictly necessary because inevitably things take longer than you hope. LH: For the first couple of years I remember saying that 80% of running a reading series was moving chairs around. I used to go pick up folding chairs from the old Spartacus Books location on Hastings and Princess and pack them into the back of a Car2go because Estlin and I didn’t have a vehicle. Now I think 80% of running a reading series is answering email. And writing email to try to get people to answer your earlier emails. I would have loved to have been able to bring in more writers from afar if we had more funding; we were so lucky that Vivek Shraya and Jacks McNamara were already planning to come to town when we booked them. EKG: Can you identify any learning bumps, or moments that were breakthroughs for the series as a whole? Or was your process developing the events more integrated and gradual? I remember a few things I learned doing the Postal Code Readings for the anthology I coedited, V6A: Writing from Vancouver’s Downtown Eastside. Sometimes it was impossible to nail down the reading order because authors didn’t have access to email or phones and if their plans changed it was impossible to know until we were underway. Things became a lot less stressful when we decided to pull names from a hat at the venue. At other readings I learned how to accommodate people’s physical and mental health and work schedules in part by asking about preferences for reading order beforehand. I think people forget how stressful it is for some authors to sit waiting in the audience – some want to “get it over with” and others don’t mind at all. EM: We had so many learning bumps! Luckily, our commitment to being around in a more long-term way (hey, we made it five years!) and to constantly but slowly implementing change allowed us to build trust with community – I think people could see that we were really listening to feedback and then making changes, even if it took some time. I recommend that commitment structure to other organizers: to be public about accepting feedback and demonstrate the changes you’re making but at a pace that allows you to still function as a person in the rest of your life. The piece of our mandate around making one change per event towards greater accessibility kept us thinking and working to be make our events better without getting too overwhelmed by trying to do everything at once. With that in mind, we bid a fond and grateful farewell to the name LITANY, and welcome in the new name for our series: REVERB. After a year of creating and transforming community through queer lit, this name echoes of how all your stories and words have stayed with us through this process. Reverb, or reverberation, is described as “the persistence of sound” after it has been produced – and we like to think that an anti-oppressive space for queer writing to resonate will continue to make some noise even beyond our events! A reverb is made up of reflections; we hope that this series provides space for you to reflect and be reflected, in all your many layers. LH: I do feel like a lot of the labour I was asked to do during REVERB was often highly feminized and sometimes sexualized. There was a lot of caregiving, and while care is 100% essential to successful organizing, I did feel like the expectations around the division of that caring labour were unequal because I’m femme. The great thing about organizing with your bestie is that Estlin is the most caring person I know and intuitively picked up on all this stuff and we were able to talk about it and even out the workload between the two of us, as well as with our many many friends and volunteers. EKG: What sorts of reverberations did you notice through communities – or yourselves – in the days or weeks following a reading? EM: I always felt a surge of hopeful creativity after a reading – they were so inspiring! For all the energy putting on event took, after each event I felt replenished and excited and curious to get back to my own creative work. I noticed other people having a similar response – I always got a lot of questions about whether there were upcoming writing workshops or other events like REVERB. EKG: Your careful attendance to the readers and listeners makes me wonder about what sorts of supports you as organizers identified as necessary and how you enacted those. LH: I really struggled to find full-time work while I was doing REVERB – and then as soon as I did, the series felt almost completely unmanageable. I was exhausted from organizing work events and sitting at a computer for seven or eight hours a day; then I would come home and sit at the computer and organize another event for another couple hours. If we were lucky, Estlin and I maybe paid ourselves $100 each once every couple of events. On event days I would work all day, come to the venue, maybe eat a thing, and not be home until 10 or whenever the event was all cleaned up – if I was lucky someone would drive me home. Then Estlin and I would each try to respond to Facebook messages or online feedback in tandem and ASAP. That was actually a big part of why we started implementing the active-listener system; I was like, I am so tired at the end of the day, I am a husk, and if someone needs support or has immediate feedback I will not be able to receive it. We needed to build in some folks with more capacity and skills to do that work on the night of the event. EKG: Can you share any favourite moment(s) of the series? EM: That was a particularly magical event in my memory. It was our first themed night – REVERB Sci-Fi and Fantasy Edition! Something about that seemed to bring out the hopeful nerd in everyone, so yes, there was a lot of laughter. And some very profound moments, the kind where you can feel the whole room shimmer. Getting to hear adrienne maree brown speak to a vision of the future that we can create through our writing was very healing for me and I think for everyone in that room. As queers, it’s easy to spend a lot of time in despair. I found that at REVERB, that despair was consistently acknowledged – and then we moved into it, through it, and beyond it through the shared laughter, through witnessing each other’s vulnerability and poetic power, and through celebrating the courage it takes to create and share your work. I guess that’s what I mean whenever I refer to the events as “magical,” and that’s definitely something I miss already. LH: One of the most wonderful things about the event was being able to see so many people we loved in a room together. There are so few sober, early-evening queer events (let alone accessible events) and I always loved knowing that I would get to see so much of our community in the same room – even if I was too busy running around to actually catch up with anyone. As a queer from a small town I also think my favourite part of the later events was when people I had never even seen before in Vancouver started coming. Towards the later events I remember talking to Estlin backstage and being like, Who ARE these wonderful people? There are SO MANY QUEERS! It was so good to know that our limited advertising (and more likely word of mouth) had reached outside of our particular friends and queer families. EM: So many wonderful people! For me, it was absolutely stunning to see people creating community through our events. I was floored by the number of times folks told me that REVERB was the place where they first came into queer community in Vancouver or where they finally found a space to connect and feel at home. It doesn’t get much better than that. And to know that people made new friendships, started going on sweet dates, and became recognized as writers or artists in a space that we facilitated was so special. I know that some folks really started to believe in themselves as writers just because we offered them a slot in our line-up. That’s magic, to me. That now there is another writer sharing their gifts with the world simply because we made a space for them. That’s all I ever wanted as an organizer! EKG: Thank you both for everything you have done and continue to do to make Vancouver’s literary community more healthy and inclusive. What are you moving towards now? Where can we find you and your writing? LH: Right now I’m working on a long-form piece about my family’s Jewish heritage in pre-Holocaust Romania. It’s going to be slow going, but in the meantime I’ve been very lucky to have a few poems published on Word and Colour, a new online literary magazine that I think has a similar ethic to what we were hoping to achieve with REVERB and features some really exciting visual artist-writer collaborations. EM: I keep my website pretty up-to-date with my writing stuff, but things have been slow in the writing realm for me these days because I started working full-time and moved house recently. In general, I’m working on a young adult novel about being a gender weirdo and having Italian grandparents (two things I am very well versed in!) and I’m always chipping away at a poetry manuscript that is currently less “manuscript” and more “random list of semi-completed poems,” but you know. I write a lot of to-do lists at work. Estlin McPhee is a writer, magic-maker and collective organizer, who grew up on Stó:lō land and now lives on the lands of the Musqueam, Squamish, and Tsleil-Waututh people in Vancouver. They work with youth and kiddos, and once upon a time ran The Sunday Shortstack, a pop-up pancake and folk music cafe. Estlin’s writing is kicking around in places like The Maynard, Matrix, Plenitude Magazine, SAD Mag, and their desk drawers. Leah Horlick is a writer and poet who grew up as a settler on Treaty Six Cree Territory in Saskatoon, Saskatchewan. Her first collection of poetry, Riot Lung (Thistledown Press, 2012), was shortlisted for a 2013 ReLit Award and a Saskatchewan Book Award. Her second collection, For Your Own Good (Caitlin Press, 2015), was named a 2016 Stonewall Honour Book by the American Library Association. Last year, she was awarded the 2016 Dayne Ogilvie Prize for LGBT Emerging Writers. This entry was posted in Interviews and tagged Estlin McPhee, Interview, Leah Horlick, Reading Series, REVERB, Vancouver. Bookmark the permalink.